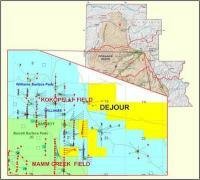 Dejour Energy Inc. says that 2014 development operations are underway on its previously reported Kokopelli joint venture (the 'Kokopelli Project'). The drill program for 2014 is focused on developing additional production from the liquids-rich Williams Fork formation on the southern leasehold (where drill permits have already been acquired) and testing the deeper Mancos, if final permitting can be achieved in time. Pad 21B is currently being built and equipped for the drilling of at least 8 wells, following the drilling and completion of a water disposal well that will service all remaining wells to be drilled in this area of the southern lease. It is anticipated that upon completion and fracture of these wells, by the end of November 2014, each will be tied into the existing infrastructure that services the Company's current production base. 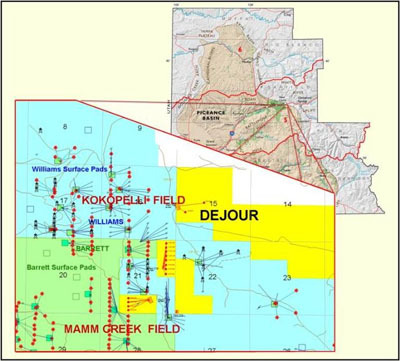 Dejour is fully carried for its 25% working interest through the first US$16 million in expenditures for the Kokopelli Project.